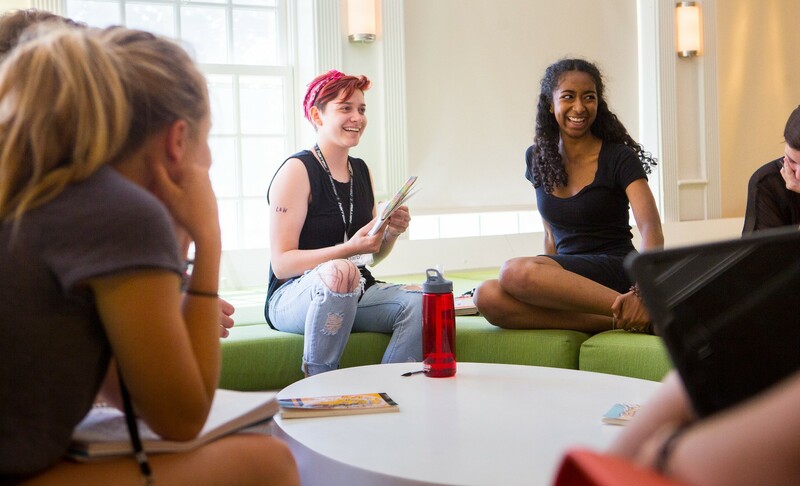 Our Young Writers get to know each other as a community by living together in a University residence hall, eating together at our award-winning dining commons, writing together in "pods," and attending evening electives and open mics. Residential life is an integral part of the Juniper experience, and the cost of a shared suite in the Commonwealth College Residential Community is included with tuition. Residence Directors live in the residence hall and are on call 24 hours a day. The Residence Directors are trained members of the UMass Res-Life program and offer support, guidance, and supervision. Activities outside the dorm end by 10PM, and lights out is 11PM. Each air-conditioned suite offers two double rooms, one shared common area, and two full bathrooms. Participants will be placed with one roommate, and two other suite-mates (Institute attendees) based on age in a gender-specific floor of the residence hall. The rooms provide each guest with a twin bed, dresser, desk and chair, and a linen pack consisting of two flat sheets, a pillow with case and a thin blanket. No toiletries are provided. Please note that there are no televisions, microwaves or refrigerators in the bedrooms. If you have any special accommodation requests or needs, be sure to indicate these when you enroll so we can make any necessary arrangements before your arrival. Check-in begins at 9:00 am Sunday, July 21, and check-out is by 10:00 am Sunday, July 28. We are unable to accommodate early arrivals or late departures, so be sure to plan your travel accordingly. Still have questions about Residence Hall lodging? Contact the Registration staff (413-577-8102, registration@umass.edu). Groups of 10-12 participants are assigned Program Assistants (PAs) who serve as counselors, role models, fellow writers, and coordinators of residential life and literary activities. Participants travel with their pods for morning workshops, then rejoin the full young writer community for afternoon studio sessions, salons, open mics, and other electives. Participants eat meals together in a designated dining commons on campus. The University’s award-winning food service provides a variety of choices (including vegetarian and vegan options) for each meal. It’s not unusual at one meal to have a choice between sushi, pho noodles, create-your own stir-fry, pizza, pasta bar, or deli station. Not to mention the soft-serve sundae bar. All meals are included in the cost of tuition.